I get annoyed when people dismiss certain vegetables out of hand as ‘fattening’. I spoke with a lady the other day who said she couldn’t eat potatoes because they had too many ‘empty carbs’ and she questioned ‘what’s in them anyway?’ Firstly, you don’t have to eat potatoes for breakfast, lunch and tea. Secondly, we could all learn to shown some restraint with portion size. But to rule out an incredibly nutritious vegetable altogether I think is wrong – especially one that has such a strong history with this country to the point where it has become synonymous with Ireland. How the potato got to Ireland in the first place is a bit of a mystery. Sir Walter Raleigh, Sir Francis Drake and John Hawkins have all been credited with introducing the tuber into Europe. The usual story for Ireland is that Sir Walter Raleigh brought it here when he was came to help suppress the Desmond Rebellions between 1579 and 1583. However, there is absolutely no evidence to support this dating from that time in any of the Raleigh-related estate records. Some evidence comes in the form of hearsay some 100 years later through the minutes of a Royal Society meeting held 13th December 1693 when it’s president Sir Robert Southwell (1635-1702) stated that his grandfather had ‘brought potatoes into Ireland who had them from Sir Walter Raleigh after his return from Virginia’. This may or may not have been the case. There does seem to be a connection with Spain however as an early name for potato was An Spáinneach. A likely scenario is that the first potatoes reached us from Spain via commercial trading routes. Either way, Ireland fell in love with the spud. And as a staple food of a country, potatoes weren’t a bad option. They were one of the few staples that one could live nutritionally on exclusively which was the case for about 40% of the population in the 1800s. Potatoes are a good source of protein, vitamins and minerals such as iron and zinc, and of course the First World dreaded starch. All was good until 1845 when the potatoes were struck by blight and this, coupled with Ireland’s political and commercial practices at the time, resulted in the famine. When Irish people think of potatoes their eyes often glaze over at the thought of freshly boiled new potatoes and rubbing the thin skins off before eating them with butter, salt and some new onions. 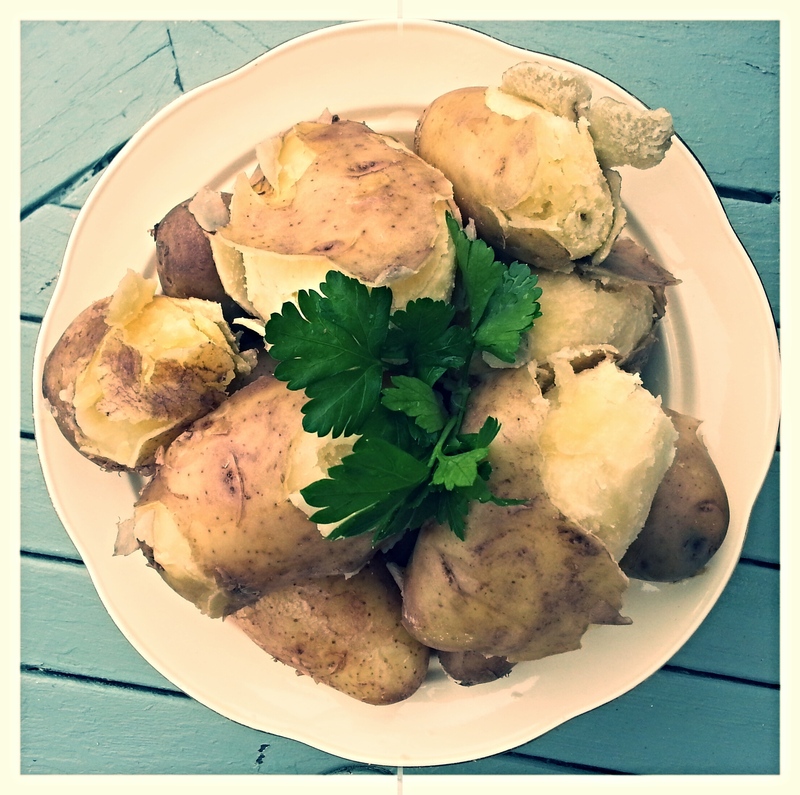 Or colcannon, which is one of the most celebrated of Irish potato recipes and one of our favourites. It has all the simple goodness of floury potatoes, kale, milk, butter and scallions – Heaven! Maybe this is what the lady meant when she said that she couldn’t eat potatoes as they were fattening. But is there any dish that can evoke an Irish childhood more? Boil the potatoes in a large pot until tender. Always start with cold water, never using hot water. Otherwise you will end up with floury outside and a hard middle. Add 3 tablespoons of butter to a pan over a medium heat. Add the kale and cook until just wilted. This should take about 5 minutes. Strain the potatoes. Add the milk, butter and scallions to the pot and let simmer gently for 2 minutes to infuse the milk with the scallion. Add the kale and the peeled potatoes to the pot. Mash until smooth. To serve traditionally, make a crater on top of each portion using the back of a spoon. Add a knob of butter to each crater so that every forkful of colcannon can be dipped into the lake of melted butter. Re-post of article published her in October 2014. 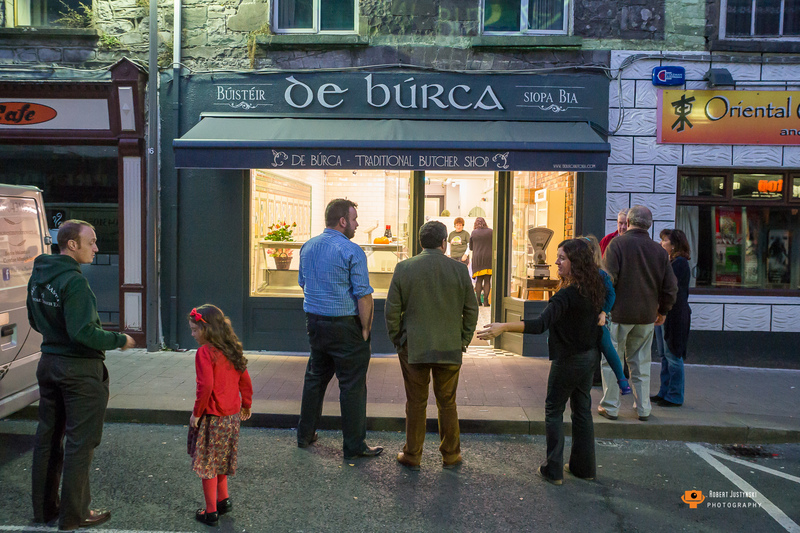 Seán Bourke and Sarah Ní Shúilleabháin had talked about opening their own butcher shop for a very long time. The conversation started in earnest on their honeymoon in Normandy where they had rented a cottage on the outskirts of a small town called Coutances. Every afternoon they used to go to the local butcher shop in the town. 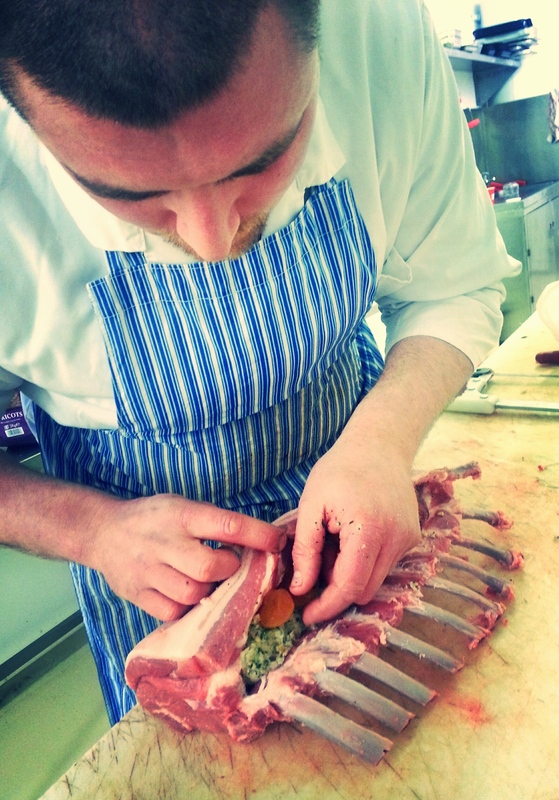 They could get loin pork chops on the bone, rind on or shin of beef or a rib of beef on the bone with a lovely spattering of yellow fat. And the meat tasted really good. They remembered meat like it from when they were children and they wondered why they couldn’t get these cuts so readily in Ireland anymore. Seán had trained as a butcher in Castlebar before moving to Dublin with Sarah in 1998 where she studied Biomedical Science. Seán worked in Troy’s Butcher Shop on Moore Street and in Dugpak on the North Strand Road. They both then moved to Nenagh in Tipperary in 2001 where Sean worked in Hanlon’s butcher Shop and Sarah worked as a Medical Scientist with the HSE. The conversation continued about meat and their own butcher shop. 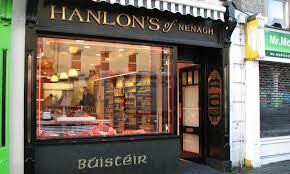 Nenagh was too small for another butcher shop and so they looked back home to the west. Seán is a local from Breaffy and Sarah is from Loch con Aortha in Connemara. They looked at Galway and at Mayo and finally settled on Castlebar. They were originally interested in premises just off Main Street but thankfully that didn’t work out, because they took a chance and walked into McHale’s on Main Street to chat with Martin and to say to him that if he was ever thinking of renting the shop that they might be interested. He took their number, and three months later in January 2014, he called. It was only a matter of weeks before the lease was signed and Sean started work in the shop on Friday the 4th of April. Sarah was to stay in Nenagh with their two little girls until things got up and running in the shop. However, it became clear on that Friday that this was something they were going to do together as a family. Sarah handed in her notice to the HSE the following Monday and she and the girls joined Sean in Castlebar two weeks later. The renovation of the shop started almost immediately. They couldn’t afford to close the shop to renovate so they spent nights and weekends working to reorganise the layout to suit the very clear vision they had for De Búrca’s. Sarah had been gathering images and photos of shops and renovation ideas since their honeymoon in 2007 for their own shop one day – alot of the ideas have now being implemented. 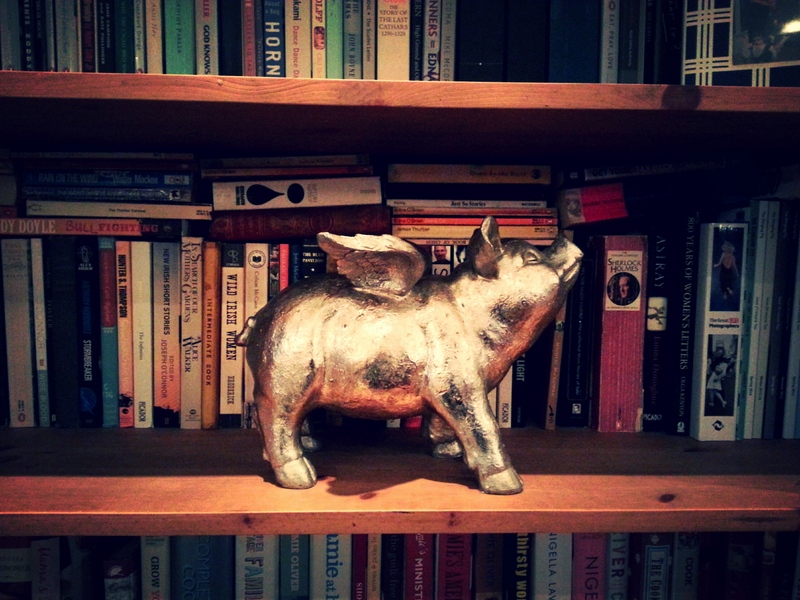 They wanted to open a shop that was sustainable in terms of meat – in other words they buy in locally reared whole animals on the bone and used the whole animal nose to tail. They are very close to reaching their target of complete sustainability. Chicken is a stumbling block for them in this aim because customers want more chicken fillets than what they can afford to buy in whole. Developing their processing side has helped them in being more sustainable in terms of meat because it allows them to use the whole animal more easily and the wonderful by-products of this are their sausages. 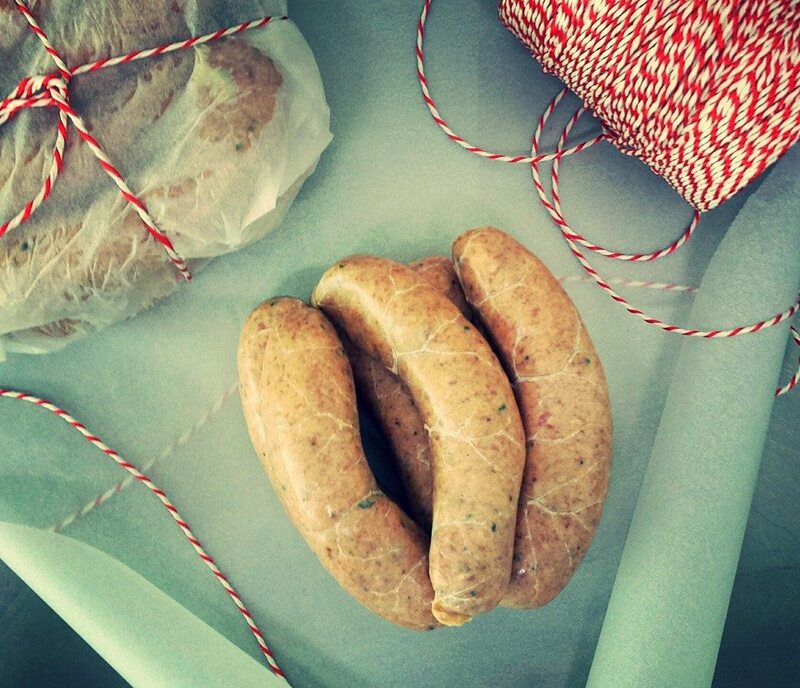 They have always had a keen interest in making sausages and have practiced sausage making for years at home. It was a more daunting prospect to make sausages for the public and they wondered how they would be received. Their sausages are very meaty. 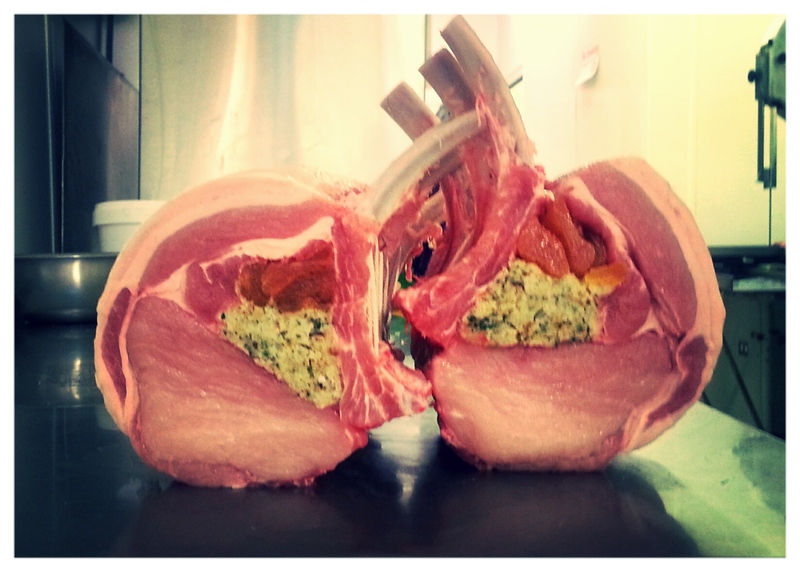 They are made with the best locally-reared pork and their own spice and herb blends in natural casings. They have been experimenting with recipes for years and currently have their version of a Traditional sausage, a Cumberland sausage and a Hot Italian sausage for sale in the shop. 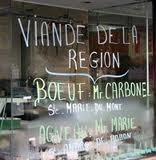 They are currently working on a North African Merguez-style lamb sausage and a Garlic Pork sausage. In their counter you will see the usual cuts of meat, the striploin and T-bone steaks, the legs of lamb and the roasts of beef. You will also see shin of beef with a neat pile of marrow bones beside it for stews. You will see the pork loin chops on the bone and pork shoulder chops for braising. You might see an oxtail tied neatly in a circle if you’re lucky because the minute it’s put out in the counter it is sold. You can have your ox tongue plain or pickled. Seán takes great pride in his counter display and especially now as the shop is almost nearing the end of the renovation and is starting to look how they envisioned it.